There are many reasons why people choose laminate flooring. Our latest blog post talks about why laminate flooring is so popular. 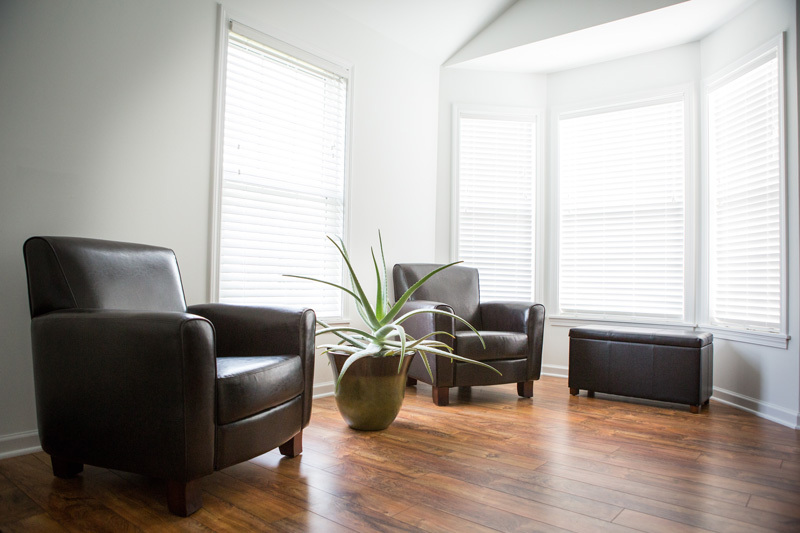 Laminated wood flooring is the hottest floor-covering product in America. Created in Europe, the product has now been in use for over 20 years. Laminated wood flooring is an interlocking system that is installed on top of an existing substrate. This type of laminated wood flooring has been used in the renovation of older buildings throughout Europe. This floating laminate installation can be used on any hard, flat surface and is easy enough to be a DIY application. Floating means that the new floor is not attached to the floor underneath and the joints are glued together. 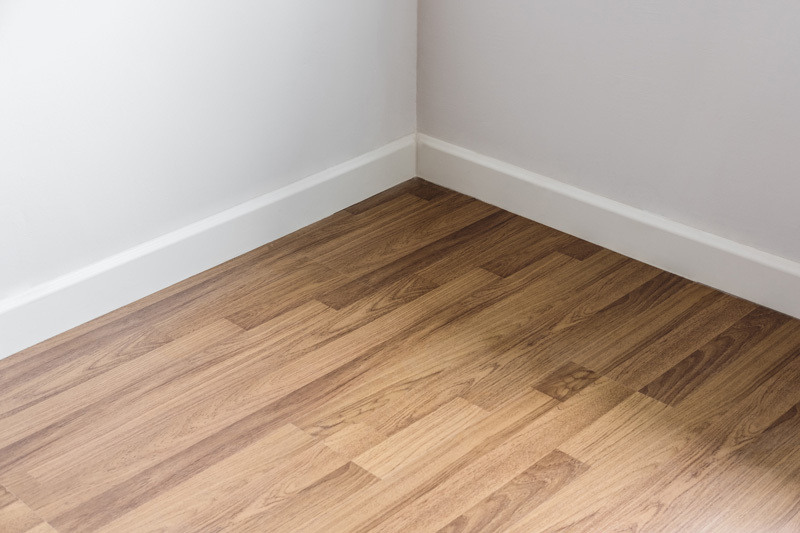 Our friends at Direct Wood Flooring have published a guide on How to Fit Laminate Flooring. This video will provide you with all the necessary information about everything you need to fit laminate flooring. A water-resistant glue is recommended by most laminate flooring brands. The glue is used on every plank, between the tongue and grooves. The amount of glue used varies by brand. Pergo laminated wood flooring requires enough glue to completely fill the groove; the excess is squeezed out when the tongue and groove are interlocked. This laminate brand has a unique PerCore base layer that soaks up the glue. Meanwhile, Pickering brand laminate flooring requires only a 1/6-inch drop of glue on the groove. Formica flooring requires a 1/8-inch bead in two places on the groove or tongue. All these laminated flooring brands give you the same results, with different installation methods. 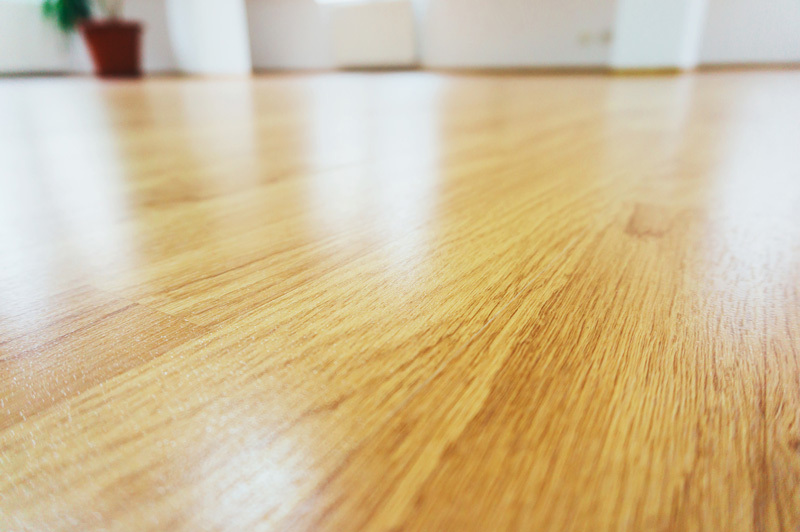 Finally, Alloc flooring has a patented system that doesn’t require any glue. Laminate flooring has four main elements that are bonded together. First, a durable, decorative surface made of resin-based melamine/aluminum oxide is affixed to a moisture-resistant wood core. A backing is then added to the core’s bottom side. On top is an aluminum oxide layer, providing stain resistance. By using existing counter-top practices and adding more protection to the top layer, laminates have evolved into the perfect floor covering. Some manufacturers say their laminate floors are as much as 20 times harder than any laminate counter tops. This strength is due to the dense, resin-filled wear layer that’s resistant to stains, scratches and even cigarette burns. The most common styles of laminate wood flooring have a wood-grain appearance. However, some manufacturers offer laminate flooring in realistic stone and marble patterns. Laminate floors are produced as long, rectangular planks, usually around four feet long and 8 inches wide. Some manufacturers also offer square tiles and double wide planks. Discount laminate flooring is often marked down to a clearance price because of factory overruns or the need to make more space in the warehouse for new flooring. 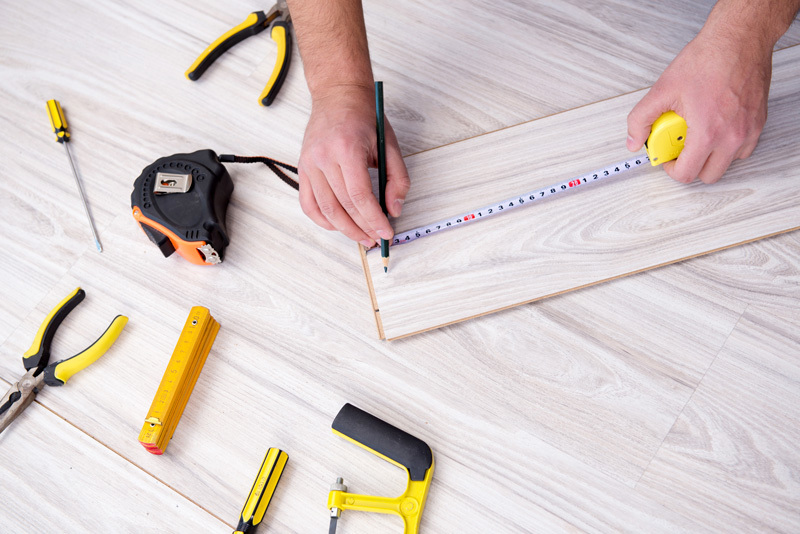 If you are not in a rush to install laminate or hardwood flooring in your home, you can save a lot of money by checking for discount flooring on a regular basis. 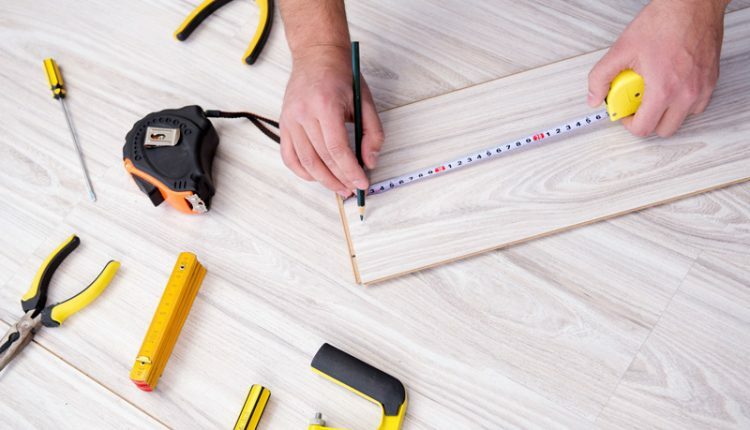 When you find the flooring at the discount price, you need to have your measurements ready and order a bit more than what you need. This is because the discount laminate flooring may only be available for a short period of time. In some cases, the discount hardwood or laminate flooring may be cheaper because the retailer is going out of business or is no longer selling a specific brand of discount hardwood flooring. If this is the case, you do need to order more than you need. If the discount laminate flooring is only for a certain time and you do run out, you will have to pay the higher price if you have to go back to the store for more. In some instances, the discount prices of laminate and hardwood flooring could be 80% of the regular price. Some people have the idea that the term discount laminate flooring or discount hardwood means a poorer quality flooring, but this is not true. If you go shopping for laminate flooring because it is cheaper than hardwood, you might come away with new hardwood flooring for your home because of the discount price. When you see an ad for discount laminate flooring, go and get it right away. However, you do need to know that the retailer is trying to move this stock as quickly as possible, which accounts for the low price of discount hardwood flooring. Therefore, there are no reserves permitted and you must pay the full amount up front. You will not be able to place a deposit on the laminate or hardwood flooring until you are ready for it. Even if you don’t need the discount laminate flooring right away, you can still buy it and store it in a cool dry place. The same thing applies to hardwood flooring. With hardwood flooring, you do have to open the packages and spread out the boards to allow the wood to acclimatize to its surroundings. This process is different than with laminate flooring. When you open the packages of discount laminate flooring, you must be able to install the planks right away.